The finding, published in Proceedings of the Royal Society B journal today, has important implications for the disease and could also help us to understand how human cancer evolves. 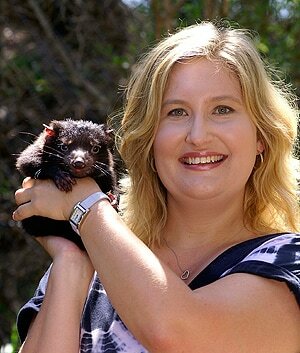 “This is the first time that the role of epigenetics has been shown to play a role in this devastating disease which has already killed 85 percent of the Tasmanian devil population,” said lead author Associate Professor Kathy Belov, from the Faculty of Veterinary Science. Epigenetics refers to changes in genetic tags – modifications to the DNA which are able to be inherited but are not caused by changing the DNA sequence. Changes in these tags can affect the way different genes are switched on or off and can be caused by external factors such as stress, diet and nutrition. “Epigenetic changes can result in differences in how a gene is expressed without altering the DNA sequence. We found that in devil tumours these tags have been removed over time. There were more tags five years ago than there are now. This suggests that more genes have been switched off in today’s tumours than those in the past,” Dr Belov said. Tumours in different devils have the same DNA sequence but this study shows that tumours in different animals differ at the epigenetic level. This matters because epigenetic changes can affect the behaviour of the tumour. For instance, it could slow down the growth of tumours or help them hide from the animal’s immune system. It could also affect the rate at which tumours spread through the devil’s body. “The next step in our research is to determine if the tumours are evolving to become more aggressive or less aggressive, to help us to manage the species in the wild,” Dr Belov said. The research also provides a unique model for studying the evolution of cancer. Normally a cancer occurs in a single individual and dies with that individual, but in the case of Devil Facial Tumour Disease the cancer is passed from animal to animal and during this process it is exposed to different environments. This means selection can act on different tumour variants driving the evolution of the cancer. “By understanding how cancer evolves in DFTD we will be in a better position to tackle human cancers that evolve following unsuccessful chemotherapy,” Dr Belov said. Reversing epigenetic changes has already been used for the treatment of some human cancers, so these findings provide new opportunities to develop therapies. Dr Beata Ujvari, from the University’s Faculty of Veterinary Science and colleagues from the Department of Primary Industries and The Walter and Eliza Hall Institute are collaborators on this study.